Home › Energy-Efficient LED Lighting › Kealive Solar Lights Outdoor Lighting With 5 Led Spotlights Adjustable Waterp..
Kealive Solar Lights Outdoor Lighting With 5 Led Spotlights Adjustable Waterp..
Waterproof (IP65) : Durable waterproof IP65 designed to withstand different weather conditions. 2-in-1 Tool-free Installation: Stick into the ground / Use included screws to mount on the wall as wall lights. Power Source: Powered by rechargeable lithium battery (2200mAh). Recharged by sunlight and restore power for overnight use. Nice and Bright Light up your home and garden without the hassle of electrical wires. KealiveSpot Lights are equipped with 5 super bright LED lights and delivers up to 9hours. Durable and heavy duty, it is designed to withstand dirt, water andsnow. All Night Your spotlight charges by day and automatically lights up from dusk tosunrise. Usage Landscape spotlights, spotlight fixtures, path lights, commercial streetlighting, area lighting, outdoor in-ground lights, patio wall light fixture. 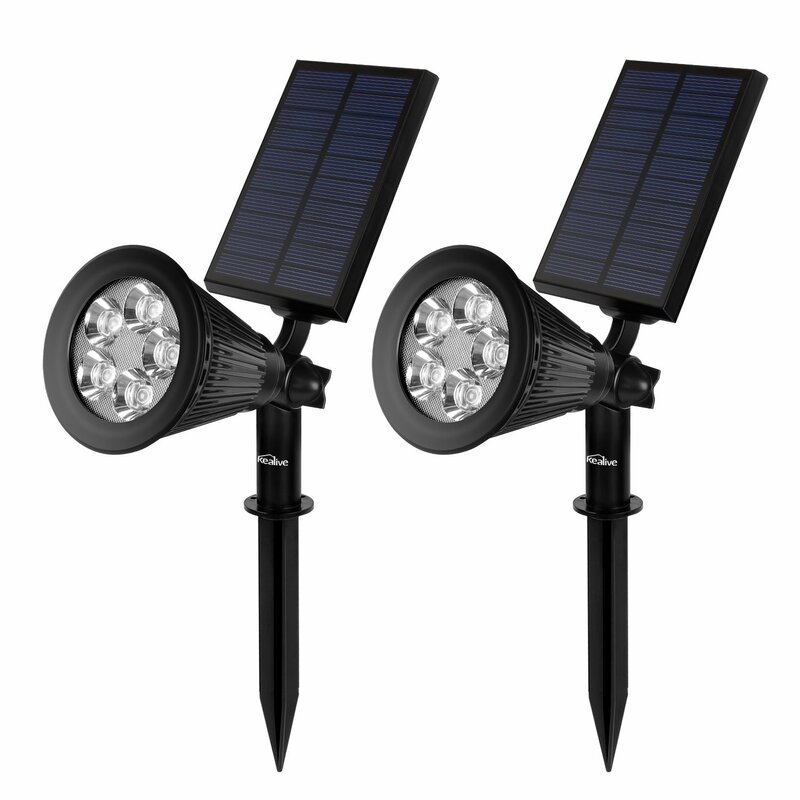 Package Contents 2 Kealive Solar Spot Lights 6 Screws and Bolts User Manual 24 Month Warranty Specifications Dimensions: 11.4" x 3.7" x 13.4" Weight: 8.8 oz (250g) Charging Time: 4 Hours Working Time: 6-9 Hours Mode: Dim / Bright NOTE 1. We strongly recommend our dear customers to hang or insert the solar lightto the place where there is no shelter, glass or shade on the top. And it mayfunction better if the solar panel can absorb more sun exposure and directsunlight. 2. The solar light charges even in cloudy days, but bad weather condition mayweaken the absorption of the solar panel. 3. You should long press the button for five seconds to turn on when firstuse. 4. Please make sure to turn on the switch before use. The spotlight islight sensitive and won't light up in bright place. To turn on the light inthe daytime, please fully cover the solar panel and make sure there is nolight source or sunshine detected.